Zesty and savory, our Neapolitan Herb dark balsamic has just the right amount of acidity to shine in a multitude of culinary applications. 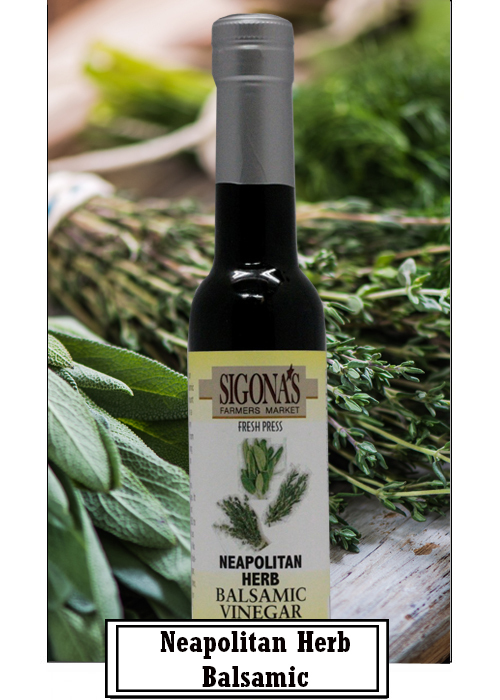 Made from traditional herbs long used in Neapolitan cuisine including, rosemary, marjoram, thyme, garlic and sage. It will boost your next salad, marinade or BBQ to the next level. Try drizzled over roasted vegetables or fresh sliced summer heirloom tomatoes. Use to marinate poultry, Portabella mushrooms, pork or a thick rib-eye steak before grilling. Fantastic in dressing, drizzled over cucumbers, or with creamy cheeses. Use it to take your recipe to the next flavor dimension. We’ve also found it to be fantastic paired with Garlic Olive Oil, Blood Orange Fused Olive Lemon Fused Olive Oil, Lime Fused Olive Oil or Tuscan Herb Olive Oil. All natural, no artificial flavors, thickeners, no added sugar.